Pushing back on Bill Proxmire’s anti-science legacy. For left-leaning Wisconsinites like me, there are a handful of U.S. senators in our state’s history that keep us convinced that we have the best politics in the country, despite certain occasional aberrances from the progressive ideal that I won’t bother to point out. One is Tammy Baldwin, currently serving; another is Russ Feingold, “the conscience of the Senate” until his untimely defeat in 2010. Others included the original Wisconsin Progressive, Robert “Fighting Bob” La Follette, and, for a third of the 20th century, William Proxmire. An early critic of the Vietnam War, a leader by example on campaign finance reform, and the driving force behind the U.S. adoption of the international Genocide Convention, he was for the most part a liberal’s liberal, on whom Feingold and a generation of Wisconsin Democrats would model themselves. But there is one aspect of Bill Proxmire’s legacy that dwarfs the others—and I’ll admit, it can be a little tough to abide. I’m referring to the Golden Fleece Award, which more than anything else he did brought Proxmire into the national spotlight. In 1975, he issued a press release announcing the National Science Foundation was the first recipient of the award, which he devised to bring attention to what he believed was frivolous government spending for dubious causes, especially in the realm of scientific research. The NSF had spent $84,000 in taxpayer dollars to fund a study on the origins of love. Proxmire didn’t think that was a good use of $84,000. And thus, a new generation of headline-grabbing anti-intellectualism was ushered into an institution where such posturing had a storied legacy on which to build: Congress. Proxmire doled out Golden Fleece awards to dozens of government agencies, including the Department of Justice, the National Institute of Mental Health, and NASA, often successfully stripping funding from their projects in the process. Scientists and their advocates were not amused, saying that Proxmire was presenting the intents of research projects unfairly to make them appear frivolous to a public predisposed to gobble it up, and that the award was a ploy for attention and political gain. 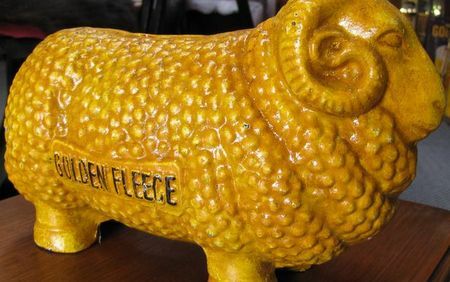 While some of the projects he highlighted and stopped truly were stupid, the Golden Fleece Award did more harm than good: it halted legitimate research for political purposes, and worse, engendered widespread suspicion and hostility towards the notion of government spending on science, even when it represents only the tiniest portions of the overall budget. It is the latter reason that makes those of us who want to love Proxmire for his litany of other accomplishments so uneasy, especially now that the mantle of equating scientific research with government waste has been taken up by the worst parts of the Republican Party, from cranky media obsessives like John McCain to anti-spending zealots like Tom Coburn. Bashing science in this manner became the cool new thing for the right—and it was a Wisconsin progressive who had made it cool! One thing to note about Eng’s and Coulter’s work is that it happened a while ago—Eng’s in 1992 and Coulter’s way back in 1947. These were, shall we say, happier times for government spending on science: Proxmire wasn’t even in the Senate by 1947, for example. In these dog days of sequestration, scientific research would not be at the top of any appropriator’s list even if Golden Fleece Award had never become a household term. So it’s likely that the Golden Goose Award will have to continue focusing on rewarding the government-funded good deeds of years and decades past for the foreseeable future. Fortunately, there’s plenty of material to work with when it comes to beneficial scientific research that had help from the taxpayers. If the Golden Goosers are successful in bringing attention to the importance of government-funded research over the years, they might manage to surprise those who have been hoodwinked with the anti-intellectual politicking of many of today’s Republicans and their Democratic precursor from Wisconsin. If they are, the scientific community and the country will be better for it—and maybe we’ll be able to focus on the more beneficial things that Bill Proxmire did.